Friendship Community Church (FCC), a Grace Brethren congregation in Fort Myers, Fla. (Rich Schnieders, pastor), celebrates their first Sunday in a new facility this weekend as they have moved to a different location to better accommodate their growing congregation. The new location is 10251 Metro Pkway #116, Fort Myers, FL 33966. He continues with the story: “Many of our folks like to have a table to put their Bibles and books on for Adult Sunday School and for the worship hour. Due to attendance growth, we had been slowly removing more and more of the tables until we no longer could have any table set up in the auditorium. We came to the end of our lease at the end of 2010 and began looking for a suitable location to lease. It was anticipated in the depressed real estate market we live in it would not be that difficult to find suitable space. However, we discovered many owners would rather leave a unit empty than to lease it at the current acceptable market rate. We eventually entered into an agreement to lease the vacant unit next to the unit we had occupied for six years only to find out permits to complete the build out would be very difficult if not impossible to obtain. After prayer and leadership discussion, we abandoned that project and set out to find another facility. “The FCC leadership prayed and considered our options. We consulted with Grace Brethren Investment Foundation (GBIF) about the potential of buying property and building. After working through the numbers we thought it would be unwise for us to follow that path as it might jeopardize our commitment to missions we have maintained since our beginning. We believe it is more cost effective to lease a facility that provides us growth space but is substantially cheaper than building a new building. “FCC leadership asked the congregation to sign up to pray for the month of August. We asked for two people to pray every day about finding the right location. A calendar was created and the month of August was all about prayer. We looked every day at the commercial real estate listings. We spent hours on the phone with realtors and owners. Then a new listing was found. Twice the space same lease payment. Then another space that looked perfect also came available. We called the realtors for both spaces, no return calls. We tried again and waited, prayed and prayed some more. “One of these two potential locations already had a church in the space. Once the realtor called he arranged for the leadership team to tour the facility. The facility is in a commercial three building campus with great security and maintenance. We met there and immediately knew this was the place God had been preparing for us. We told the realtor and the owner that we were very interested in it, but we did not want to be party to forcing another church out of the space. The owner made it clear to us that he had no choice but to terminate the lease with the other church as they were several months behind on the rent. The existing church was made up of mostly migrant workers and with the work gone so were they. The church was shrinking every week. They knew they would have to give up the building eventually. The building owner and realtor worked with them and we offered to assist them in potentially renting our old space if the landlord was willing to work out a reduced rent for them. We don’t know what happened with them but we have prayed for them often. “The other great potential location ended up being leased only a couple days after being listed. When the realtor finally called back all he could advise was it was leased. It was clear God was leading us to the building we had just toured. “The night we agreed with the owner to move ahead with a lease we received a call from the realtor for the second great potential location that had been leased in just a couple days. The realtor advised they were having difficulty in coming to an agreement with the potential new tenant and asked if we were still interested in seeing it. We told him we were but it had to be that day as we were preparing to make an agreement on another location. The realtor advised he would try to work that out. We believe God was testing our commitment to following His clear direction. “When the realtor failed to call back, FCC leadership agreed we would move ahead with the first building. We entered into the agreement with the owner and a few days later we were given keys to the building. The previous church moved out in just a couple days and we were given access three weeks early. That allowed us to paint, clean carpets, and install our audio visual equipment. “We now have a beautiful large youth room, a children’s classroom and nursery as well as a room that the leadership has prayed for more than a year. FCC started a food pantry for members and friends of FCC. We ask for each person to bring one item of non-perishable food every service. We store that food and make it available to our church family and friends when they have times of need. We have some that receive food regularly without any government support. We don’t advertise the pantry to others outside of our church family, it is there for the family to help the family. Our new facility has a room set aside to store that food. In our old facility, the shelves were in the auditorium. “We could comfortably seat 25-30 people in our old facility with no nursery and the youth met in the front room where people gathered before the worship service; not very conducive to very long lessons. Now we have a beautiful fellowship hall to sit and have a cup of coffee and a cookie before the service while Sunday School is finishing. The youth are not disturbed. We have a nursery that will have sound and eventually video from the auditorium. We can accommodate close to 100 in the new auditorium. 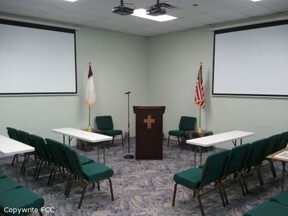 We purchased new more comfortable chairs, new hi-def projectors and screens to make the new facility as comfortable as possible. But most importantly to make it a place where people come to worship, fellowship and study God’s Word. “The congregation has really worked hard at getting the facility ready for services with our actual move in day–Thursday September 22, 2011. Our first services will be this Sunday, September 25, 2011. We have more than twice the space, a beautiful layout and we still pay less than we budgeted for rent this year. God has richly blessed us. “We prayed today as a group of tired, hot, and sweaty movers in the new auditorium and thanked God for the new facility. We thanked Him for the process He took us through to get to that point. But most importantly we prayed that we would be worthy of this new facility and the mission it brings us. FCC is committed to our missions partners and to the teaching of God’s Word in a clear and relevant way. Even though we have not grown fast we know the hearts of those involved in this ministry, we know the hearts of those that have grown as a result of God working through this ministry. We asked God to grow us in ways the door counters can’t see. When we dedicated the month of August to pray for a new building God gave us a new building at the end of the month. When we signed the agreement, we had special gifts given to purchase the new chairs and electronics totaling more than $11,000 dollars. That is more than our regular offerings for a couple of months. We have watched God work throughout this process. God has blessed us and we are excited about what is coming next. Congratulations on the new facility - it looks great! We praise God for the privilege of partnering you for reaching both Fort Myers and the world for Christ. God bless you.